Sakai Guides and DocumentationSakai Basics Resources ToolHow do I upload and unpack a zip file to a Resources folder? 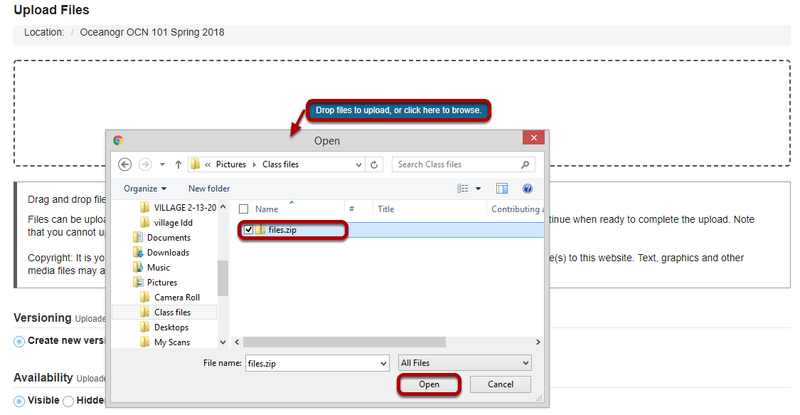 There are two methods for uploading a zip file to Resources: drag-and-drop and the upload file functionality. Once you have uploaded the file, you may use the Actions / Expand Zip Archive functionality to unpack the zip file into its component files. From the Actions menu, select Upload Files. Zoom: From the Add drop-down menu, select Upload Files. From the Actions drop-down menu to the right of the folder where you want to upload the zip file, select Upload Files. Zoom: Drag and drop the zip file from your computer. Drag the zip file from your computer and drop it in the box marked Drop files here to upload. Or, click to switch to a file browser view. Zoom: Or, click to switch to a file browser view. If you prefer to browse for your file instead, click the Drop files here to upload, or click here to browse button to go to the file browser view. Locate and select the file on your computer, then click Open to upload. Zoom: Click Actions, then Expand Zip Archive. From the Actions drop-down menu next to the zip file, select Expand ZIP Archive. The zip file is automatically unpacked within the current folder. A new subfolder within the current folder is created using the name of the zip file. The zip file content is unpacked within this new subfolder. The original zip file remains. Prev: How do I upload files to Resources? Next: How do I create a zip archive file in Resources?